Loughborough University’s striking Design School has been named Building of the Year in the regional ProCon awards. The annual awards celebrate the excellence and dynamism of the property and construction industries in Leicestershire. 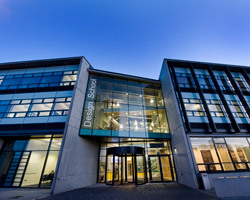 The Design School, which was completed in 2011, was designed by Burwell Deakins Architects and built by Shepherd Construction. It includes innovative teaching and lecture space, workshops, offices, research laboratories, design studios, computer and prototyping suites and areas for display and interaction. The University's leading designers and ergonomists are now based in the school. Earlier this year the Design School picked up three Royal Institute of British Architects' (RIBA) East Midlands regional awards for Client of the Year, Sustainability and Building of the Year, before winning one of the top accolades at the RIBA’s annual ceremony. 3. Loughborough is one of the country’s leading universities, with an international reputation for research that matters, excellence in teaching, strong links with industry, and unrivalled achievement in sport and its underpinning academic disciplines. It was awarded the coveted Sunday Times University of the Year 2008-09 title, and is consistently ranked in the top twenty of UK universities in national newspaper league tables. In the 2011 National Student Survey, Loughborough was voted one of the top universities in the UK, and has topped the Times Higher Education league for the Best Student Experience in England every year since the poll's inception in 2006. In recognition of its contribution to the sector, the University has been awarded six Queen's Anniversary Prizes. It is a member of the 1994 Group of 12 leading research-intensive universities. The Group was established in 1994 to promote excellence in university research and teaching. Each member undertakes diverse and high-quality research, while ensuring excellent levels of teaching and student experience.